The Shibatas join The Art League to lead a ceramic workshop. Students learn the traditional Japanese Pottery methods of wheel throwing, coil building, and slab building. Demonstrations and hands-on time a both included. Hitomi and Takuro present a slide lecture on their experiences, inspirations and influences, wild clays in North Carolina, and their wood firing methods. This workshop will focus on possibilities for using natural materials. Students will learn how to process and test wild clays, ash glazes, and clay slips. Bring materials for your area to test and leave with results and the knowledge of how to experiment further at home. We’ll also make pots with stoneware, cover Japanese making and decorating, and fire gas and salt/soda kilns. Some throwing experience will be helpful, but this workshop is open to all levels. Hitomi and Takuro are excited to be a part of this amazing pottery show! We hope to see you there! The Clay Studio have invited Hitomi and Takuro Shibata to reflect on their journey of their collaborative business Studio Touya that started in Shigaraki, Japan and is currently located in Seagrove, NC. The exhibition will explore their use of local wild clay and to discuss their role of collaboration in creating a business together. Some of the work is available for sale through the Clay Studio website, please click the link below or please go to their website. Thank you! 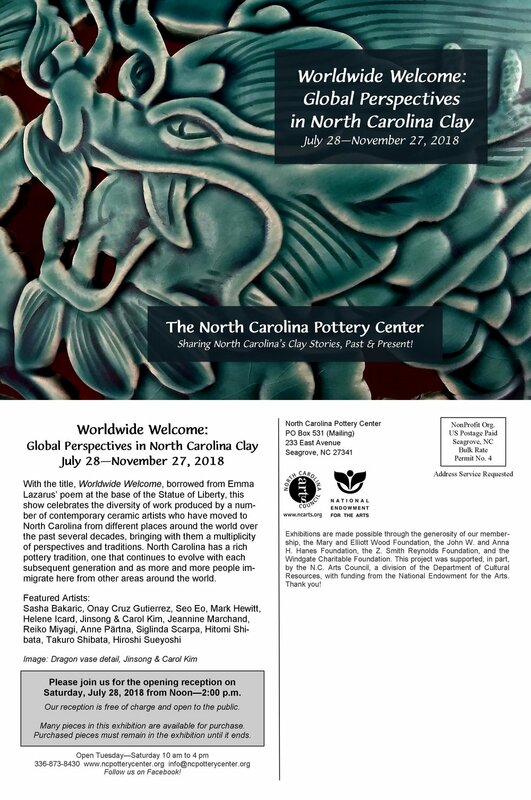 Worldwide Welcome explores and celebrates the diversity of work produced by a number of contemporary ceramic artists who have moved to North Carolina from different places around the world over the past several decades. North Carolina has a rich pottery tradition, one that continues to evolve with each subsequent generation and as more and more people immigrate here from other areas around the world. Please join us for the Opening Reception on Saturday, July 28, from Noon-2:00 pm. The reception is free and open to the public. Many of the pieces in this exhibition will be available for purchase. Purchased pieces must remain at the center until the exhibition's end date. This Exhibition Showcases the diverse International Presence at Cub Creek Foundation, which invests in importance of cross-cultural learning. March 12-17: Reception: Thursday March 15th 6-8pm. Opening on Saturday, December 8. Exhibition will open December 5. Curated by Edie Carpenter, Winter Show brings together over 120 artists each year from across North Carolina and constitutes a comprehensive survey of the finest art and crafts being produced in the state. The artists come from around the state, with a mix of mediums including painting, sculpture, photography, ceramic, jewelry, woodwork, fabric and fiber works, all within a harmonious installation. Artists showing work in the exhibition vary not only by mediums, but also by experience, background and perspective. The public is invited to view a carefully curated selection of works from emerging and returning North Carolina artists in The Gallery at GreenHill. With over 500 works all available for sale, Winter Show is the quintessential showing of art produced by North Carolina artists today. This immersive workshop offers participants the opportunity to learn how to fire The Peters Valley Noborigama wood kiln and also teaches the practical skills and techniques for glazing, loading, and firing a wood kiln. Participants will bring their own bisque pots made from Cone10+ clay for glazing and then load and fire the Noborigama kiln with instructors, Takuro and Hitomi Shibata, potters from Shigaraki Japan. The Shibata’s have years of experience firing many different wood kilns and currently live in the largest pottery community in the US in Seagrove, North Carolina. They will share their glazing techniques, loading aesthetics, and wood firing methods with participants. The Shibata’s will also discuss efficient way to process/recycle clay, Japanese wood firing history/techniques and provide hands-on information about testing and using wild clays. Participants will work with wild raw clay samples from NC and make small tests to fire in the kiln as well. We have a special Guest Artist to fire our Anagama kiln with us! and flashing from fire path. • 2 pieces per person: up to 9 in high x 6 in wide - No plates, bowls or flat objects. To kick off the exciting pre-conference festivities, Ben Owen III is hosting a party at his pottery on Saturday evening, June 3rd. Pick up a copy of the new book “CONTROLLED BURN: WOOD-FIRED POTTERY IN SEAGROVE, NORTH CAROLINA”, featuring the Seagrove Preconference potters. Shibata, Hitomi Shibata, and Sukjin Choi. Special March Exhibition " Earth, Painting and Fire"
" Earth, Painting and Fire"
Lillstreet Art Center is proud to present the Cub Creek Foundation: John Jessiman With Visiting & Resident Artists, curated by Cub Creek founder and director John Jessiman. The Cub Creek Foundation is a non-profit ceramic educational facility located on a 100-acre property in Appomattox, VA. After years of teaching summer programs at Archie Bray and Alfred University, John Jessiman bought the land with the intention of creating “a residency program where emerging ceramic artists could prepare for advanced study and/or develop their careers.” In 2002, Cub Creek accepted its inaugural class of residents. In the years since, Cub Creek has been host to more than 50 residents and numerous workshops. This exhibition features the work of 16 artists who have passed through its doors: Jessiman, Bede Clarke, Chuck Hindes, Chris Gustin, Dan Murphy, Jack Troy, Josh Deweese, Randall Edmonson, Ron Meyers, David MacDonald, Mitch Iburg, Andrew Avakian, Daniel Molyneux, Ed Feldman, Shanna Fliegel and Takuro Shibata. Break away from the winter doldrums and visit the shops along Busbee Road the Saturday before Valentine’s Day. join the Seagrove Potters of Historic Busbee Road as they host their annual Valentine celebration. are available for purchase, along with treats to sample and new ideas as you prepare for Valentine’s Day.